Understanding the ins and outs of nutrition can be difficult—so difficult that even scientists are making mistakes. The best way to maintain a healthy weight is to ignore the scams and quick-fix bogus and to instead focus on developing healthy eating habits. Try out these healthy habits, stick to them, and even if you slip and mess up here and there, if you get back on the wagon you’ll keep yourself on the road to a slim physique. Experts have discovered that those people who eat on a regular basis after 8 pm are more likely to ingest more calories and carry the most body fat. Here’s a good tip: Stop eating 3 hours before you go to sleep. By doing so your body will be more keen to burning fat than creating more of it. Hello lovelies! I apologize for being a little out of touch this past week. My boyfriend surprised me and came to Massachusetts all the way from NYC to stay for the week, so as you can imagine I haven’t been creating any new content lately. But since we are long overdue for a post, I have decided to write about a subject that is relevant to what I’ve been up to lately. So without further ado, let’s get going! While enjoying each others’ company this week, we were caught in a not-so-awesome stormy day. So what did we do? Go to South Shore Plaza of course! 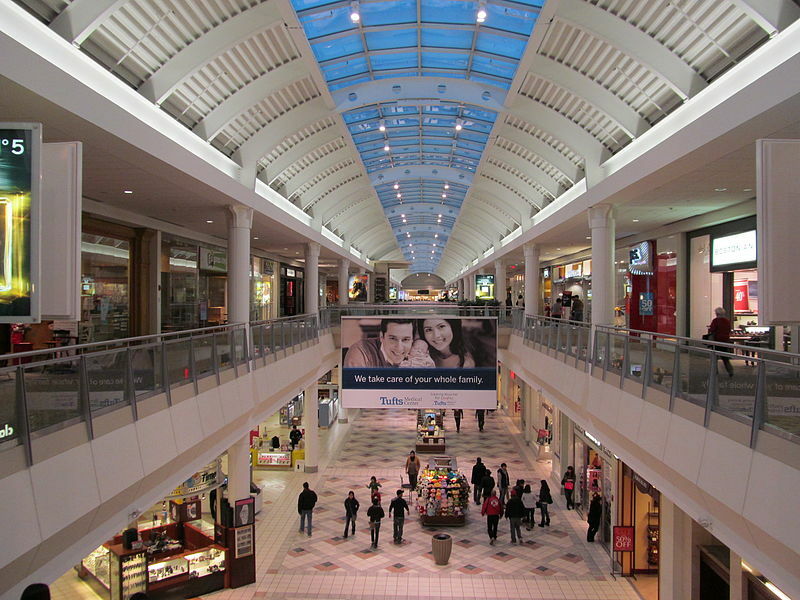 South Shore Plaza is one of the most popular shopping complexes in the South Shore (hence the name) and hosts major names such as Macy’s, Nordstroms, Sears, Lord & Taylor, and Target. Not to mention all of the best brand names you could imagine! So while Eric and I were perusing through the mall, we stopped by Banana Republic, which has a very nice selection of menswear. I’ve always welcomed the possibility of styling someone when the opportunity presents itself, and I was totally stoked! I took some pictures of some of the manikins that we saw that had a style that I thought would be so sharp – for any guy for that matter! This is one of my favorite looks that I saw in the store, actually. As soon as I saw it I knew I had to document the sheer amount of style that manikin was exuding! Looking at this outfit, I had my boyfriend in mind, who is more on the leaner side and has a smaller frame. In terms of fit, if your guy is on the thinner side, I say go for clothes that are tailored and fitted to the body as much as possible. If you try to wear things that are too big or baggy it makes him look more like a blob than dashing. 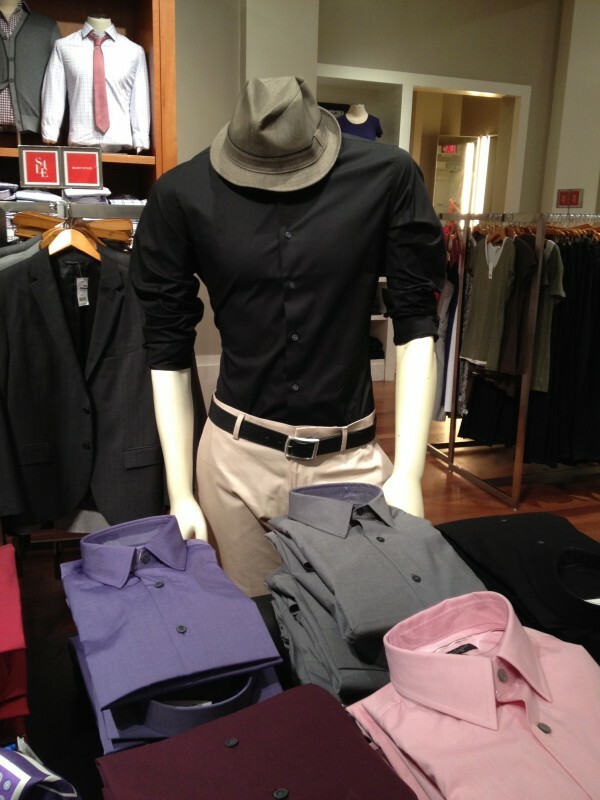 Another good tip that this manikin is exemplifying is the idea of tucking in the shirt and wearing a belt. This definition of the hips is PERFECT for creating a sharp, clean-cut look and really shows off your guy’s leaner frame. Another major thing to think about in outfits is BALANCE. If you look here (you may not see very clearly in this photo) but as I felt the heather gray trousers, the legs had a lot of room and were not restricting in any way. 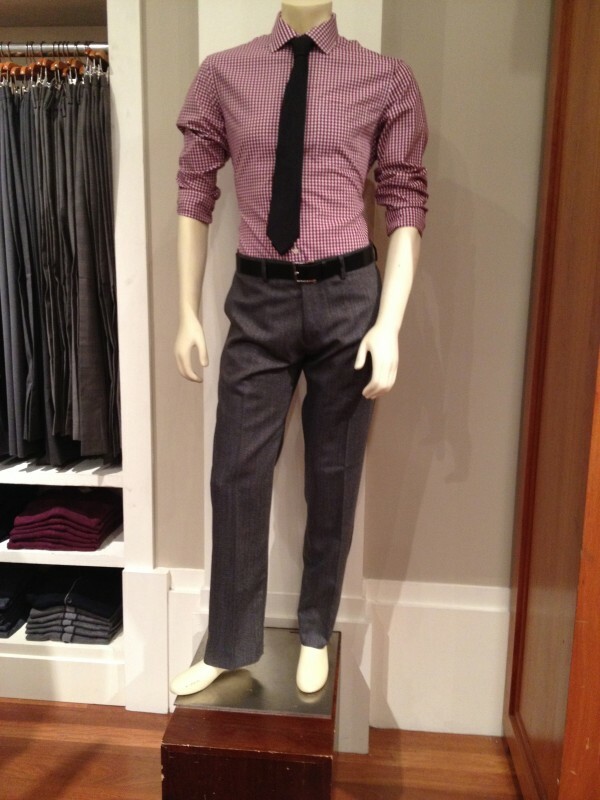 In order to balance a looser pant, the manikin has a tighter, fitted dress shirt with a skinny black tie that really completes the look and makes your guy look sharp and clean-cut. Whenever you create a look, just remember…BALANCE BALANCE BALANCE!!! Unfortunately this manikin did not have any legs to show some polished pants, so for now we’ll focus on the top of this look. 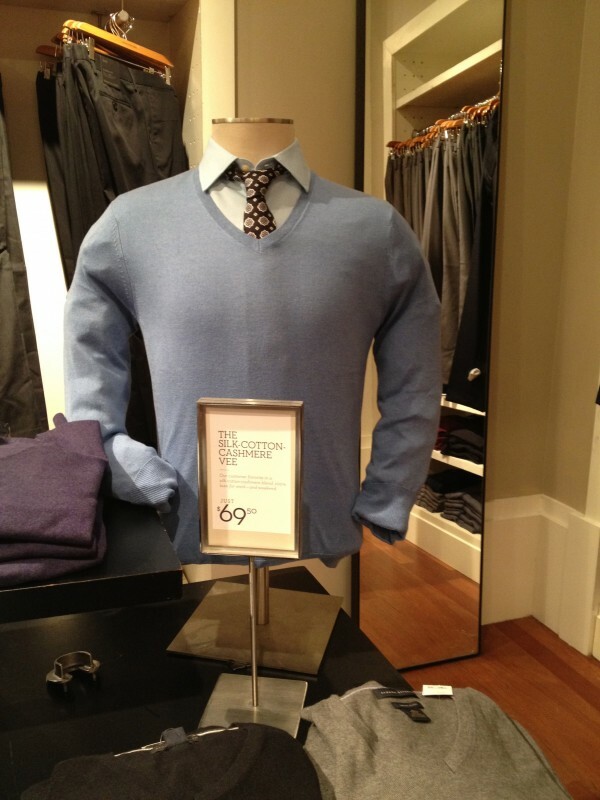 If you want your guy to have a very sophisticated, classic look, the V-neck sweater, collared shirt, and tie combo is a great direction to go in. In terms of this combination, make sure that the colors you are selecting work together as a team instead of working individually. That way, you create a different kind of balance. Not one of fit, but one of color and pattern. And the one piece in this outfit that is really the focal point here is that classy fedora. I for one LOVE when guys wear hats. And I don’t mean baseball caps. Seriously…they come in so many styles and colors and can really change the way your guy looks. In my mind, they give him some personality and tells me that he isn’t afraid to show off some style. If you want to experiment with hats, try to find one that is a neutral color, like black, gray, tan, or brown. That way, you can pair it with almost every outfit and can give you a lot of versatility.